JUVEDERM® Voluma is a new injectable soft tissue filler from Allergan Medical that is designed for maximum lift, not maximum plump. Voluma’s fantastic counterparts, JUVEDERM Ultra and Ultra Plus, are both designed to add volume and plump, and not necessarily geared towards lifting the soft tissues of the mid face that stubbornly descend with age. 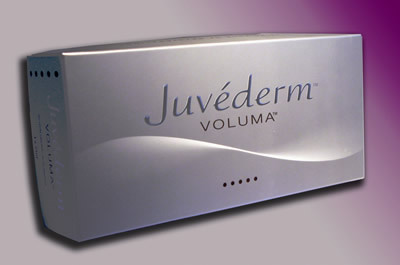 Dr. Nicholas Vendemia offers JUVEDERM Voluma for women and men in the New York metro area. We encourage you to contact us online or give Manhattan Aesthetic Surgery a call at 917-703-7069 to schedule a visit. Dr. Vendemia is a leading cosmetic surgeon in New York City with a reputation for custom care and beautiful results. Voluma’s main competitor is Sculptra Aesthetic, which is an excellent collagen-stimulating volumizer that provides a great deal of lift when used correctly. The soft and natural results from Sculptra are truly wonderful when it is used properly, and the gradual onset of the volume is considering to be a major advantage to some people who are concerned about others noticing that they had the procedure. Reversibility. Voluma is an HA (hyaluronic acid) filler, which means that it is reversible. The ability to reverse a filler is like an insurance policy that guards against having to accept a result that you aren’t happy with. Reversibility is not an option for non-HA fillers like Sculptra and Radiesse. Single Treatment. Voluma’s results are visible immediately after a single treatment while Sculptra requires 3-5 treatments and can take 3-4 months to see the results. Before Voluma came along, many women were willing to consider having several treatments of Sculptra before they saw results because once those results came, they lasted 2-3 years, which is a significant advantage over other HA fillers like regular Juvederm and Restylane. However, now that Voluma is here and claims the possibility of lasting 2 years, the multiple treatments for Sculptra aren’t as acceptable since Voluma lasts nearly as long and only requires a single treatment with immediately visible results. If you aren’t sure which product will give you the results you’re looking for, the best strategy is to schedule a consultation and go over your options with Dr. Vendemia. He uses almost all the injectable products on the market on a daily basis, and he’ll can easily clarify your list of choices after speaking to you about your goals, and examining the soft tissues of your face. Feel free to call or text our office at 917-703-7069 or send us a message through our website by clicking here.